There’s nothing better than sleeping under a sheet of canvas with a nice coy campfire to keep you warm — but you know what? I’m betting the family pooch would be of the same opinion as well! To be totally honest, I’ve always struggled to find the perfect mobile sleeping arrangement for my furry friend. That is, until I came across the Dog Swag from Mr Swagman. To be honest, this little beauty has totally revolutionised the way I travel with my four-legged pal, and that’s not something I say lightly. 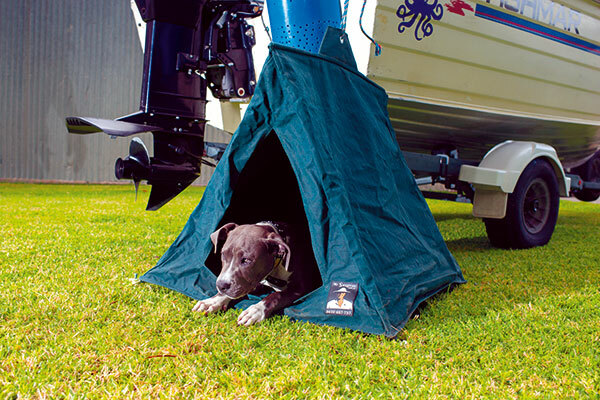 Now, anyone who’s owned a quality swag knows they’re one of the most versatile and reliable bits of camping gear on the market, so I reckon it makes a whole lot of sense to create a tailor-made version for the dog, too. Obviously, you can set this puppy up outdoors but it’s also perfect for inside the camper trailer or caravan when the weather turns bad. Oh, and if you’re visiting a friend’s house, it’ll set up in the backyard too. What I love about this particular product is there is no compromise on quality. In fact, it uses the same near on bulletproof 15oz Ripstop heavy duty canvas that Mr Swagman uses for his whole range of tried and tested swags. It’s a 100 per cent cotton fabric that’s breathable, rot and mildew resistant, UV stabilised and extremely waterproof. To put it bluntly; it’ll probably outlast your dog! There’s a high density, 20mm foam mattress included in the design, which is thoughtfully secured under a second layer canvas floor. It might not sound like a big deal, but it goes a long way to keeping the mattress clean and dry while preventing your pooch from chewing on the foam. It’s super simple to set up too. Just secure the single centre rope to something above the height of the swag and you’re pretty much done. A tree, roof rack or bull bar will work a treat! There’s also a couple of good quality pegs you can knock through the sturdy brass rings on each corner of the swag, to help keep it secured in place. You’ll find that at 80cm long x 80cm wide, it’ll suit most camp dogs perfectly. 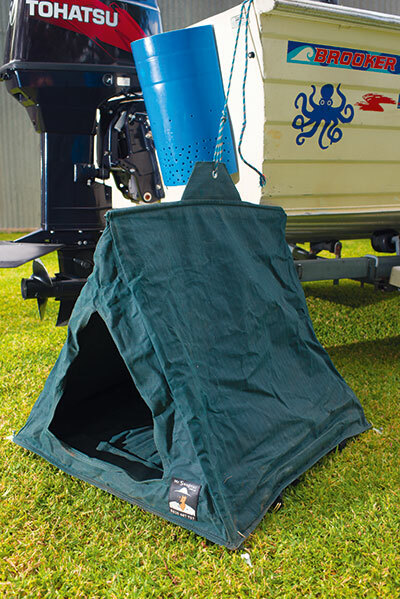 The best part is it packs down to an 80cm x 10cm roll, so it doesn’t take up much space in your 4WD or camper.